If you have been watching out the fashion space, you would have guessed that long suits are a thing now. Floor length maxis, anarkalis and gowns are being spotted everywhere and it is going to make a strong presence in the coming days. We already see fashion girls are making the transition from salwars and lehengs to these flowy suits. 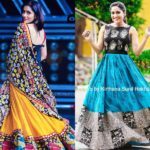 While the designers are experimenting artistic prints and fancy embellishments to make these ensembles meet the needs of modern women, there is one pattern that is emerging out strong. It is just that these suits are often worn plain with brocade dupatta. Long plain anarkalis and maxis paired with colorful silk dupattas are making a moment right now. On that, today add another enviable style. Yes, recently we spotted Shruthi Hariharan in a super chic plain suit which she layered it up with a Kalamkari jacket. It just gave this coveted silhouette an artistic touch! Those who are already bored of dupattas will now know what should be on your agenda next! 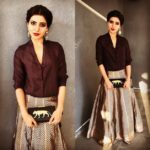 Now take a look on how Shruthi made a simple suit look totally cool. What you do you think about wearing plain suits with classic jackets? Drop your comments and let us know. We Just Love Everything About This Saree Look! Hi, it is no on sale.